Praying the rosary and meditating on the mysteries of the rosary provide countless benefits. Learn how rosary prayer can help your unique situation. Promote the Rosary on Facebook! Send rosaries to friends and help promote prayer with our new Facebook app. Click the image below and get started! A supernatural phenomenon shocked the world in 1917. A crowd of 70,000 citizens witnessed a celestial light show in the skies of Portugal that had many believing the world was about to end. However; to three local shepherd children, this event came as no surprise. To them, this miracle was a fulfillment to one of the many prophecies given to them by the Blessed Virgin Mary. Amongst the messages received by these children came numerous requests for prayers and penance. Not just ordinary prayers...but rosary prayers. In fact, the importance of praying the rosary was repeatedly stressed and reiterated by the Virgin Mary to these children during their meetings. Rosary prayers were not only necessary, but they were the key to obtaining world peace. 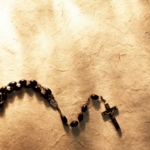 The Rosary Foundation charity promotes the power of rosary prayer by educating the world about the supernatural graces and benefits gained by praying the rosary. Through innovative online marketing and awareness campaigns, The Rosary Foundation continually strives to create an awareness for the power of rosary prayer to help fulfill Mary's promise of world peace through prayer.